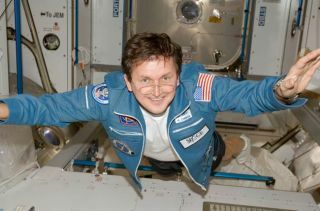 U.S. spaceflight participant Charles Simonyi, the world's first repeat space tourist, floats in the Harmony node of the International Space Station during his 2009 spaceflight. On April 28, 2001, American entrepreneur Dennis Tito became the world's first space tourist when he soared into orbit aboard a Russian Soyuz spacecraft bound for the International Space Station. Tito's weeklong space jaunt -- which cost a reported $20 million at the time -- was arranged through the Virginia-based company Space Adventures. Since then, Space Adventures has helped send six other private citizens to the space station on a Soyuz, with the most recent mission blasting off in September 2009. Space Adventures' other clients were unavailable for comments. They are: South African businessman Mark Shuttleworth (who flew to the station in 2002); American video game developer Richard Garriott (who flew in October 2008 and is the son of former NASA astronaut Owen Garriott); and Canadian billionaire and Cirque du Soleil founder Guy Laliberte (who used his October 2009 trip to help promote water conservation). In a series of phone and email interviews, the private space explorers chatted about why they decided to go to space, what their experience was like -- and whether they'd like to go back. SPACE.com: What were your main motivations for going into orbit with Space Adventures? Tito: My dream was to fly in space before I die. And I basically came up with that lifelong goal around the time of Yuri Gagarin's flight. So that was about 50 years ago. Ansari: It started out as something that I wanted to do since I was very, very young. I was fascinated with the stars, which turned into a love of science, and astronomy specifically. My fascination and interest grew and continued throughout my life. I always thought that by the time I grew up, there'd be a Federation of Planets, and a Starship Enterprise where I can apply and go fly. And then, in parallel, lots of things happened in Iran, my country. Things changed, and I ended up coming to the U.S. and realizing that it's not easy to become an astronaut through NASA. So I ended up in a different field completely -- engineering. Because this was a passion that was very strong in me, even though my career had taken off in a different direction, I always was looking for a way to be able to fly to space and experience it. It was through my company, and becoming an entrepreneur, that I was able to finally make that dream come true. Olsen: Oh, just to do it. It's interesting: I got the idea in a Starbucks. In June 2003, I was sitting in a Starbucks with a big coffee and a newspaper, and I read this story about Space Adventures. And I said, "Wow, this sounds like something I'd like to do." I grew up in the space race. I remember Sputnik and Yuri Gagarin's flight. And I remember when I was in school, that was used to motivate us to get into math and science. But really, the whole thing -- to see the Earth from space, to float weightless -- I have a physics background. It was all motivating me to do it. Simonyi: Basically, I wanted to learn things in great depth, both knowledge -- like how does the spacecraft return -- and skills, like how to give a short presentation in Russian or how to take apart a fan in weightlessness. Ansari X Prize backer Anousheh Ansari gets a push during weightless training aboard a modified aircraft. She flew to the ISS on Sept. 18, 2006 - the world's first female private spaceflyer. SPACE.com: What were the best or most memorable parts about your spaceflight experience? Tito: They had pencils hanging from strings in the cabin of the Soyuz. And these pencils just started floating, and I knew it was weightless. You couldn't really tell yourself, because you're strapped in with your belts, so you didn't float at all. But I knew that we were in orbit. Ansari: I assume everyone who goes to space -- the one thing that's very memorable and unique that they will remember is the first time that they can see Earth from space. It's like a validation of, "You're in space." It's a pretty amazing, awesome sight to see with your own eyes. No matter how many times you've seen pictures of Earth from space, seeing it with your own eyes is really different, and it touches you deeply. It stays with you. Olsen: Just being weightless, and seeing Earth. I spent 10 days orbiting the Earth, and every morning when I woke up, I used to pinch myself and say "Wow, how lucky I am, how privileged to do this." We had lots of things that were good up there, but just basically floating and looking at Earth. How can you beat that? Simonyi: If I had to take one moment, the first arrival at the ISS at sunset. It was theatrical beyond all fantasy. American entrepreneur Greg Olsen floats in weightlessness during a zero-gravity training flight for his 2005 space tourist mission to the International Space Station. SPACE.com: Was there anything you didn't like about flying in space? Tito: The worst part was the uncertainty. [Tito spent about eight months training in Russia without knowing if he'd get to fly or not.] And I offset that by saying, "Well, if I don't fly, at least this training will be an experience." I learned a lot about human spaceflight during my training. But it's not something I'd suggest you do for recreation -- take eight months of your life and go spend it in Star City [near Moscow] and not fly. Ansari: Well, the thing I really didn't like was the fact that I had to return to Earth. That was the worst part of it (laughs). And as far as the training goes -- actually, I enjoyed the training. It was hard, but just thinking that -- "My God, I'm training with all the other astronauts and cosmonauts, my heroes that I always admired from afar, and I'm now sitting next to them." And just walking around Star City and thinking, "Yuri Gagarin walked around here." Some of the instructors talked about him, and I thought, "Wow, this is pretty amazing." Simonyi: Some of the interactions with the doctors were a bit unpleasant, but on the flight itself I can honestly say that there was nothing I would not have done again (and, in fact, I have done it again). SPACE.com: Did the spaceflight experience change you in any way? Tito: Well, I'm empowered by that success, by being able to accomplish it. Even though I will say I accomplished my life dream, now I have some other goals that I think I can accomplish. I recently got my glider rating a couple of years ago, and now I'm working on two glider aircraft, contributing to the construction and planning on being a pilot, to set some world records for both speed and altitude. And, who knows? That might be accomplished some day. I think it's feasible. Ansari: It has changed me in a way that's hard to describe. Once you see Earth from space, you can't help but look at everything in global terms. You have that image sort of ingrained in your head. You think, "How does this impact everyone? How can this be implemented everywhere? How can this solution solve problems all over the world?" So it does change you in that sense. And it also really puts into perspective where you are in your life, and the importance of things. So I really have spent lots less time and attention on little things, and tried to focus on the bigger things. Simonyi: I had a very interesting life before the flight, and I am starting a family now, which brings new joys and excitement. So the spaceflight itself was one of the many learning experiences I was fortunate to have. SPACE.com: Would you go back into space if you could? Ansari: Oh, in a heartbeat. Simonyi: I am done with spaceflight for quite a while now -- when our neighbors have gone to space, maybe I can persuade my wife that we should go together. I would like to take my daughter on a weightless flight as soon as she is old enough. Olsen: I'd go in a second. I just have to sell another company before I do (laughs).